I was doing some random searches in Google and found myself looking at Filipino dishes to try in the Philippines. I found it odd that the top blog posts are written about it are written not by Filipinos, but foreigners. And I thought, what better person to give suggestions but a local? So I’ve made this well-curated list of foods you need to try in the Philippines! 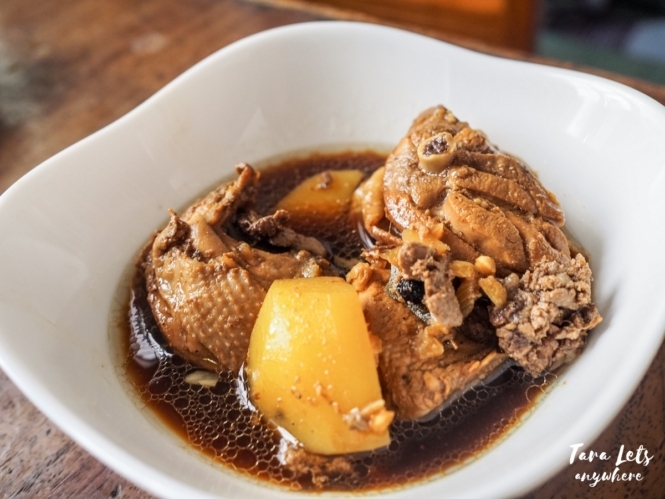 Adobo is considered the Philippine’s national dish. It consists of meat (pork or chicken or both) braised in vinegar and then spiced with garlic, bay leaf and black pepper. It has a very unique taste — the sauce is a delicate mixture of salty, sour and oftentimes sweet. It is served over white rice. There are many variations of adobo in the country, depending on the region where it’s made. There’s a joke that there’s as many recipes for adobo as the 7000 islands in the country. Aside from the regular adobo found in Manila, I also like adobo with gata (coconut milk). Sinigang is my favorite Filipino food and if I could only recommend one dish for you to try, this will be it. 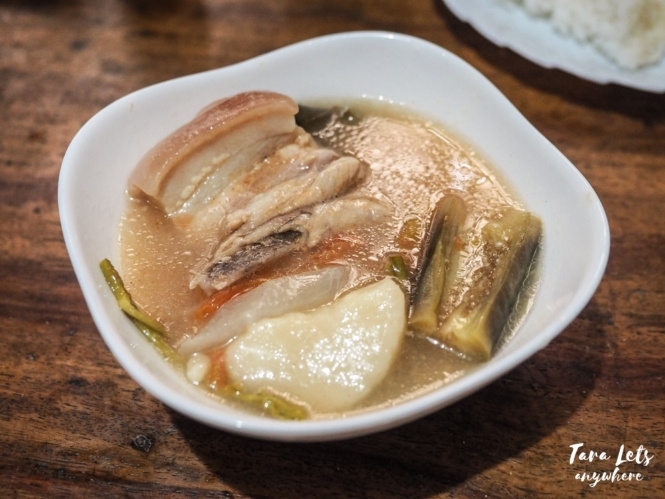 Sinigang is a stew with a sour and savory taste, which comes from added tamarind or other sour/unripened fruits. 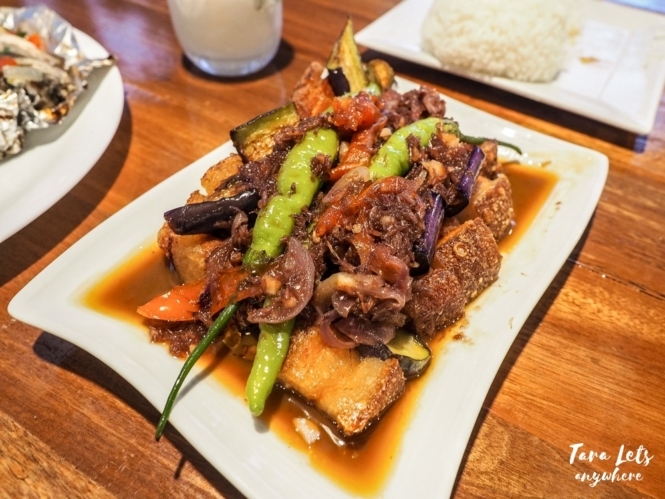 It contains meat or fish and various vegetables such as gabi (taro corms), labanos (white radish), kangkong (water spinach), sitaw (yardlong beans) or talong (eggplant). You can eat it as is or with rice. My favorite recipe of sinigang uses buto-buto (pork meat with bones which is very flavorful), although commercial restaurants rarely use this. That saying, most restaurants serve decent sinigang. I recommend getting pork sinigang. Kare-kare is a stew with a savory peanut sauce. A typical kare-kare has beef and oxtail plus vegetables such as eggplant, pechay, puso ng saging (heart of banana) and green beans. It is often served with accompanying bagoong (shrimp paste) for added flavor. It is eaten with rice. 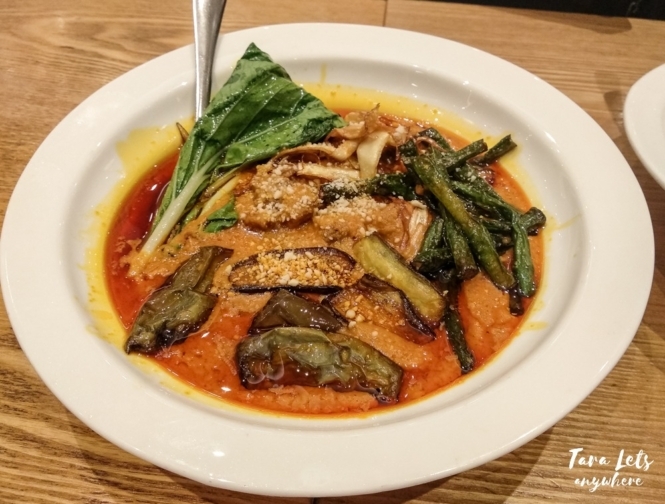 Why do I recommend kare-kare? As you can tell, it’s unique and it’s delicious. I love the thick sauce, the tender meat and how it’s a complete dish with all the vegetables included. 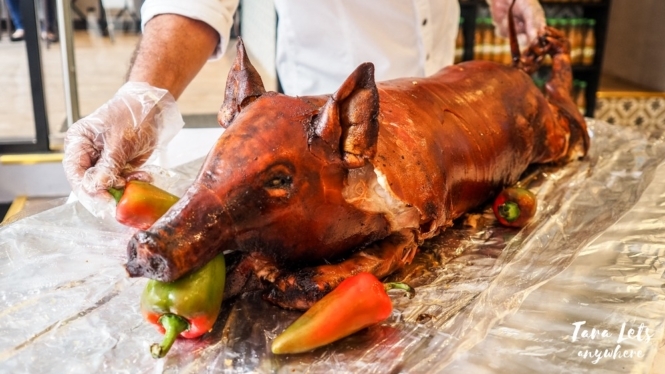 Lechon is roasted suckling pig, and it’s often served in special occasions such as birthdays, weddings or fiestas. What Filipinos all like about lechon is the crispy skin and the succulent meat. It is served with gravy and rice. Cebu claims to have the finest lechons in the country. Among commercial restaurants, one of my favorites would be Rico’s Lechon with their spicy seasoned lechon. 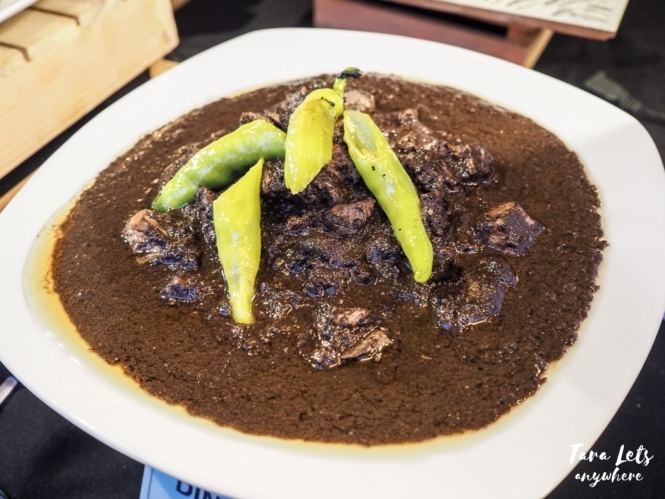 Dinuguan is essentially pork blood stew. It’s composed of pork offal and/or meat in a rich broth made of pig’s blood and seasoned with vinegar, garlic and chili. A lot of foreigners skip eating dinuguan, but I suggest that you try it out. First, it’s made from edible pig’s blood (the kind you buy at markets) and second, it’s really good. You can eat it with puto (steamed rice cake) or rice. 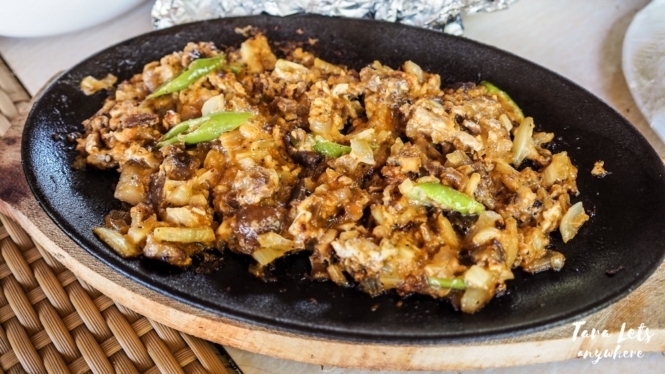 Sisig is a well-known appetizer or pulutan (food to eat with beer), although it’s also commonly eaten with rice as well. Basically, it is made from pig head and chicken liver, which is then fried or grilled and then diced. It is sauteed and seasoned with various spices. It is served on a sizzling plate, often with chicken. There’s also a version of sisig which uses mayonnaise and onions instead. Pork sisig is the most common, although you can also find chicken or tuna sisig. Sisig is delicious and you can’t go wrong with it. Even the late Anthony Bourdain predicted that it’ll be the next big thing. Laing is my favorite vegetable dish. It’s essentially made with gabi (taro) leaves and coconut milk. It’s very simple yet tasty. It tastes creamy with a sweet-spicy kick. Ginataang puso ng saging refers to banana blossoms cooked in coconut milk. The banana blossoms are soft yet firm and, similar to laing, the dish is both creamy and spicy. It’s often served as a side dish. As for myself, I can eat a small bowl of this on its own. Bistek is another favorite of mine. Bistek is Filipino beef steak — a dish made of thinly sliced beef marinated and braised in a mixture of calamansi (a citrus fruit), soy sauce, onions and garlic & pepper. The meat is tender and the sauce has salty, tangy and savory taste. Bistek is too tasty to eat on its own, so it’s best to eat it with rice. Binangoongan refers to pork belly stewed in tomatoes, shrimp paste and chili peppers. It is delicious, although some people who are unfamiliar with shrimp paste may find it smelly. Chicken inasal, or simply inasal, is a popular dish in the country. You can find a lot of restaurants selling this, most notably the fast food chain Mang Inasal (which I recommend also). Chicken inasal is a type of chicken barbeque which originated in Bacolod City in the Visayas. Essentially, it’s chicken marinated in a mixture of calamansi and then grilled while basted with marinade. It’s often served with toyomansi with chili. The chicken meat is juicy and smoky flavored, which makes it a perfect accompaniment to rice. 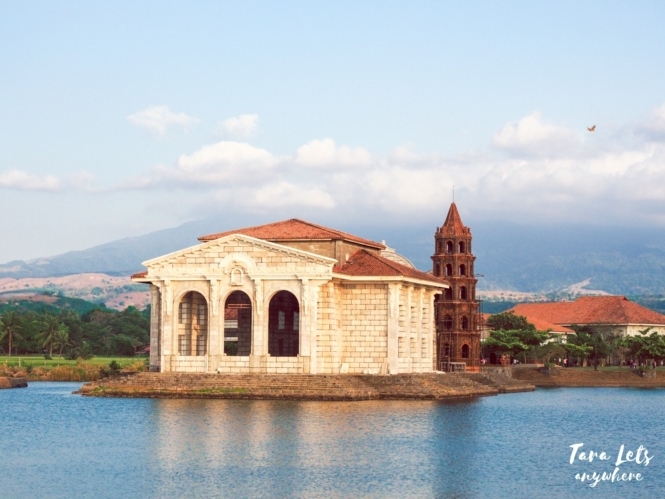 The Philippines is surrounded by abundant oceans and as such have a teeming supply of seafood. It’s one of the things I’m proud of, living here. One of my favorite seafood dishes is inihaw na bangus or grilled milkfish. The fish is stuffed with tomatoes and onions, which gives the fish meat added aroma and flavor. It’s often served with a toyomansi (soy sauce and calamansi) dip and eaten with rice. Kinilaw literally means “eaten raw”. It’s a raw seafood dish. Vinegar is used to “cook” the fish meat, and if you’re the one preparing it you can literally see the meat turn from pink to opaque white. Other ingredients are added, including calamansi, onions, garlic, ginger and chili. Different types of fish can be used to make kinilaw. I also had one before where shrimp is mixed in. The best kinilaw makes use of fresh meat. In fact, the best kinilaw I’ve eaten was when we were island hopping in Palawan and our boatmen decided to go fishing — we used the fish to make sinigang and kinilaw, which was very good. Bicol express is a specialty of the Bicolanos and represent their love for spicy food. Bicol express is composed of cubed pork meat cooked in coconut milk, shrimp paste and with lots of chili peppers. Different kinds of chili may be used depending on how you spicy you want it to be. Bicol express is a comfort food and perfect if you’re a spicy food lover. 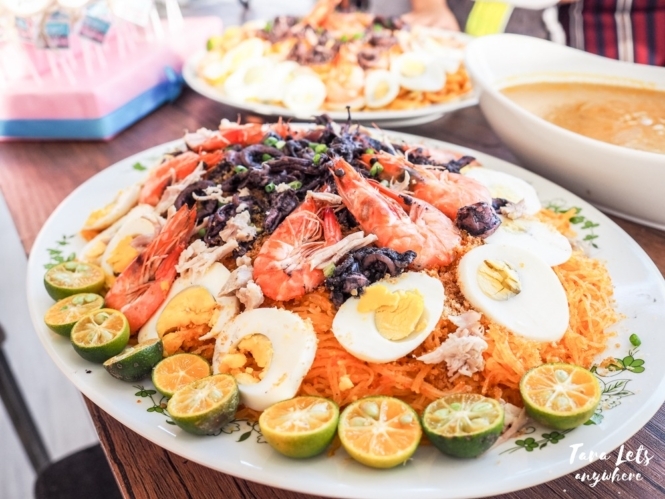 Pancit palabok is a thin-noodle dish with shrimped paste, topped with shrimp, crushed chicharon (pork cracklings), tinapa flakes, slices of hard-boiled egg, scallions and fried garlic bits. It’s a favorite snack or merienda, and it’s also commonly served in parties. My favorite palabok is actually from the fast food restaurant Jollibee. There is another version of pancit palabok which uses a thicker noodles and is called pancit malabon. Tapsilog is the Philippine’s national breakfast. No? Then I’m declaring it as such. Basically it’s made of tapa (cured beef), sinangag (fried rice, often garlic fried rice) and itlog (egg). The combinations are good and it’s guaranteed you’ll crave for it after your first try. You can’t talk about the must-try foods in the Philippines and skip halo-halo! Halo-halo is one of the most common desserts in the Philippines. Halo-halo means mixed — in essence, it’s a mixture of crushed ice, milk and various ingredients: kaong (sugar berry fruit), gulaman (jelly), nata de coco, sago (tapioca pearls), fruits (jackfruit, sweetened banana plantain, kamote or sweet potato) and pinipig. It is topped with flan, ube (purple yam) or ice cream. Halo-halo is a very colorful concoction and it’s refreshing and delicious. Some popular restaurants serve it too sweet, so you might want to ask them to halve the sugar just in case. The ultimate Filipino food challenge – balut! Ah, the infamous balut. 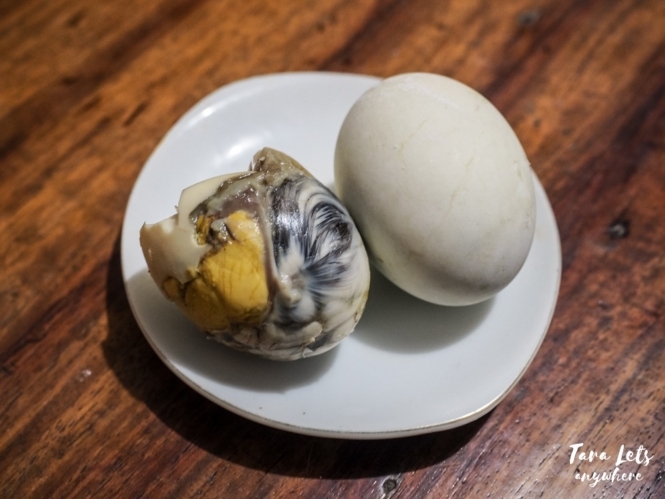 Balut is basically fertilized duck egg that is commonly boiled and eaten while still warm. It’s a delicacy in the Philippines. You drink the soup and eat the yolk and the chick. Some locals like it together with vinegar. Filipinos eat balut, but not all do. As for myself, I consume the soup and the egg yolk, both of which are really good, but leave the rest alone. Some restaurants create a new dish out of balut. That saying, it’s certainly one of foods you have to try at least once in the Philippines. Have you been to the country? What’s your recommended food to try in the Philippines?